Several Tudor queens are associated with the Tower of London. Elizabeth of York, Katherine of Aragon and Anne Boleyn all resided there the night before their coronations at Westminster Abbey, as did the Tudor queens regnant Mary I and Elizabeth I. More ominously, Anne Boleyn and Katherine Howard met their deaths at the Tower of London; both wives were executed on charges of treason within the walls of the Tower. A third queen (although her royal title has, and continues to be disputed), Lady Jane Grey, was also beheaded within the Tower. However, one Tudor queen's death at the Tower of London has tended to be forgotten in modern times. We remember the grim demises of Anne Boleyn, Katherine Howard and Jane Grey at the Tower, but we often forget that Queen Elizabeth was the first Tudor queen to die at the royal fortress. She, however, was not executed, but died following complications in childbirth. 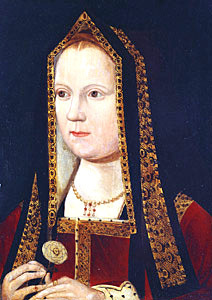 Elizabeth of York was the eldest daughter of Edward IV and Elizabeth Wydeville. She was born on 11 February 1466 at the Palace of Westminster, and became queen of England following her marriage to the first Tudor king, Henry VII. Elizabeth's life was tumultuous. She had been born a princess of England and grew up in expectation of a glorious future; she perhaps believed that it was her destiny to marry a European prince. When her brother Edward was born in 1470, the infant Elizabeth would have acknowledged that it would be unlikely that she would rule England, unlikely even in the capacity of queen consort. However, everything changed for Elizabeth in the year 1483, when she was seventeen. Following Edward IV's unexpected death, Prince Edward was proclaimed Edward V, but his uncle Richard of Gloucester seized him and his younger brother Richard of York, and had them incarcerated in the Tower of London. Rumours of both princes' disappearances began to circulate, and by the autumn of that year it was believed that they were dead. What truly happened to Edward and Richard can never be known with certainty, and it is a mystery as to whether or not Elizabeth ever learned of their fate. Both during and after her lifetime, it was rumoured that she had schemed to marry her uncle Richard of Gloucester, now Richard III, but he denied ever considering marrying her. Shortly before her twentieth birthday, Elizabeth became queen of England as the wife of Henry VII, and she gave birth to four surviving children: Arthur (born in 1486); Margaret (born in 1489); Henry, the future Henry VIII (born in 1491); and Mary (born in 1496). She gave birth to a daughter, Katherine, in February 1503, but the child was sickly and did not long survive. The queen died nine days later, on her thirty-seventh birthday. 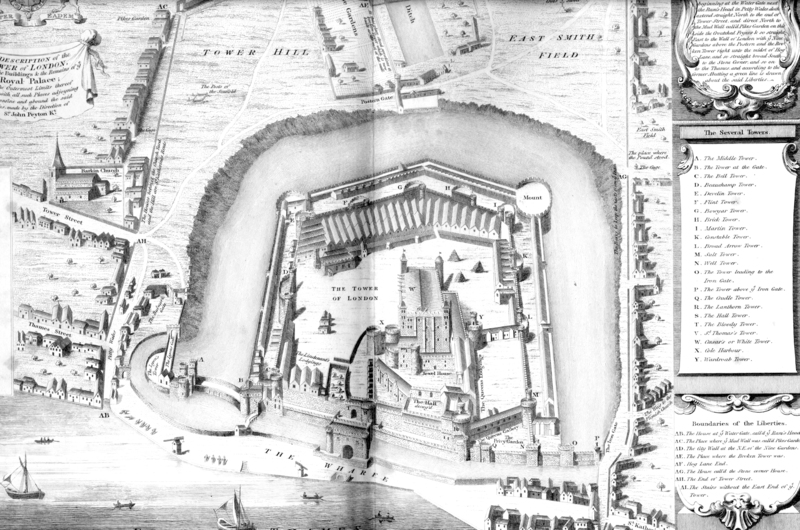 Above: A contemporary drawing of the Tower of London. The Tower of London occupied a central presence in the life of Elizabeth of York. For her, it was associated with triumph (she was crowned there in November 1487); tragedy (she died there in 1503); childbirth; mystery and a lack of fulfillment (her brothers had allegedly disappeared after being imprisoned there). Perhaps Elizabeth's most abiding memory of the Tower, during her lifetime, was the day of her coronation in the winter of 1487. At the age of twenty-one, the attractive, fair-haired daughter of York fulfilled her glorious destiny: she became queen of England as the wife of the first Tudor king. Not only did she follow in her mother's footsteps, the footsteps of another Queen Elizabeth, but she had fulfilled her father's ambition that the Yorkist dynasty should reign triumphant. Elizabeth, of course, was not a queen regnant, and her husband was especially keen to demonstrate that his accession had united the houses of York and Tudor, rather than representing a Yorkist triumph. However, everyone - including, first and foremost, Elizabeth - knew that without his wife's impeccable credentials and her Yorkist symbolism, Henry VII would not have enjoyed a triumphant accession to the throne of England. Elizabeth was vitally important in strengthening her husband's claim, and in crowning her as queen, Henry showed his recognition of his wife's dynastic importance. On that chilly day in November, the young Elizabeth sat in triumph, fiercely proud of her lineage and determined to honour her dynasty to the best of her ability. In all likelihood, for her, the Tower was a glorious setting for the occasion. It was a palace, as well as a fortress, and while its association with the disappearance of her younger brothers two years earlier represented it as dark and forbidding, for Elizabeth its positive features were probably more on show that day. Whether the queen ever learned of her brothers' fate is uncertain, but if she did not, then the Tower of London surely symbolised mystery, perhaps premature death, perhaps premature ending of hope, a lack of fulfillment. During her youth and teenage years, she was educated to view her younger brother as the next king of England upon her father's death. Richard III's triumph had snuffed out the possibility of that happening, and Elizabeth was suddenly elevated to a new position as a result of her uncle's ambitions. The Tower of London was, finally, for Elizabeth, a scene of tragedy, a setting of death. On 11 February 1503, the queen died on her thirty-seventh birthday, days after giving birth to a daughter. The Tower was associated with triumph and glory when monarchs were crowned there, but it could also be represented as dark, gloomy and associated with death. Elizabeth's death occurred at a time of coldness, darkness, and icy winter. She was the first Tudor queen to die at the fortress, but she would not be the last. However, while Anne Boleyn, Katherine Howard and Jane Grey lost their lives at the Tower at the hands of the executioner as traitors to the Crown, Queen Elizabeth was posthumously represented as a virtuous, learned and pious woman who had died performing a good service, an act that was symbolically identified as the holy, divinely ordained duty of queens: childbirth. Today, the ghosts of Anne and Jane, in particular, are believed to haunt the Tower in sorrow, unhappiness and desolation. Whether the ghost of Elizabeth of York is ever glimpsed at the Tower is a question that is almost never considered, but given her positive reputation, her dynastic achievements and her love and loyalty to her family, it perhaps seems unlikely. In fifteenth-century England, titled women, that is duchesses and countesses, enjoyed positions of great social and political importance. They were second only to queens in the power they held and influence they wielded. At that time, a duchess or countess was responsible for advising her husband; supervising her estates and assisting her adherents in a variety of matters; attending court in the queen's household; and, most importantly, bearing children (preferably sons). Even today, duchesses and countesses of fifteenth-century England remain well-known. Women such as Jacquetta, duchess of Bedford, and Cecily, duchess of York, were influential, intelligent and strong-willed. They influenced their offspring and assisted them in their schemes to take the throne. Jacquetta masterminded her daughter Elizabeth Wydeville's obscure marriage to Edward IV, while Cecily had played an important role in educating Edward and, perhaps, grooming him for kingship. Similarly, the political involvement of Margaret Beaufort, countess of Richmond and Derby, was significant. Her influence both at court and in local society ensured the continuing relevance of her son Henry Tudor's claim to the throne, and the countess emerged triumphant in the summer of 1485 with Henry's accession. However, one countess remains largely unknown, and yet her story was every bit as tragic, as unpredictable, and as fascinating as the stories of the women above named. Anne Beauchamp, countess of Warwick, was the wife of Richard Neville, earl of Warwick, who remains known today as the 'Kingmaker'. She was the mother of Isabel and Anne, and her younger daughter would become queen of England in 1483 as the wife of Richard III. In the television series The White Queen, the countess is not one of the main characters, but she is portrayed as a shrewd, intelligent woman who played an advisory role to her husband. She was depicted as being extremely close to her two daughters. Whether the real countess enjoyed good relations with her offspring is unknown. Above: Anne Neville, the younger daughter of the Countess of Warwick. Anne Beauchamp was the daughter of Richard Beauchamp, thirteenth earl of Warwick, and Isabel le Despenser, who was the sole heiress of her deceased father Thomas. She was born in July 1426 at Caversham Castle in Oxfordshire. In 1434, when Anne was only eight years old, she was betrothed to Richard Neville. She married Richard at an unknown date and gave birth to two daughters by him: Isabel (born in September 1451) and Anne (born in June 1456). Both girls were born at the family seat at Warwick Castle. Whether the couple were severely disappointed by their failure to have a son is unknown, but it is entirely possible given that Richard may have wanted the estates and title to remain within the family. The son of the earl of Salisbury, Richard acquired significant wealth and status by marrying Anne Beauchamp and inheriting the Warwick estates and title. Upon her marriage to Richard, Anne became countess of Warwick. The Neville family was one of the old noble families in England. They were proud of their lineage and were highly ambitious. Warwick's ambition was renowned and he played a major role in securing the accession of his cousin Edward, earl of March, in 1461. However, Warwick experienced conflict with the new king when Edward elected to marry the relatively unknown Elizabeth Wydeville. The new king's mother, Cecily, duchess of York, disliked her daughter-in-law and voiced outrage at her son's folly. Warwick similarly disliked the new queen and harboured a great deal of resentment, eventually leading him to rebel against Edward. Whether Anne Beauchamp resented Queen Elizabeth, or whether she enjoyed good relations with her, is a mystery. Certainly she would have enjoyed a favoured position at court. The sources are frustratingly silent about the countess. We know next to nothing about her. Did she welcome the favour shown to her family and did she feel pride at her husband's influence at the king's side? She surely harboured concern about the twists and turns of fortune. In 1470, the disaffected Warwick masterminded the restoration of the Lancastrian king Henry VI and his resourceful wife Margaret of Anjou, a woman who loathed Warwick. We cannot know whether the countess was on intimate terms with Queen Margaret, but she surely could not have envisaged that the queen would become her sister-in-law that same year. But that is exactly what happened. Anne's younger daughter, also named Anne, married Edward of Westminster at the age of fourteen and, in the process, became Princess of Wales. She was destined to be England's queen - but, unknown at the time, it would not be at the side of Edward, who was killed in battle at Tewkesbury the following year, leaving the young Anne a widow. Above: Margaret of Anjou, briefly Anne Beauchamp's sister-in-law. 1471 was perhaps Anne Beauchamp's annus horribilis. Not only had she lost her son-in-law, but her husband Warwick was killed at the battle of Barnet that spring. With his death, the countess lost everything. Her husband was, in the eyes of the restored Edward IV's government, a traitor. The countess herself was, by association, a pariah and she was forced to keep a low profile for a time. Her position, however, was uncomfortably ambiguous. Her elder daughter Isabel had married Edward's younger brother George, duke of Clarence, in 1469. This ensured the countess' continuing closeness to the ruling house of York. Isabel died in 1476, however, and Clarence was executed for treason two years later. These were years of sorrow and loss for the countess. In a brief period, she had lost her husband, her daughter, and both her sons-in-law. She had been respected, perhaps even loved, during Warwick's ascendancy, and she had enjoyed an influential position at court. Briefly she had been Margaret of Anjou's sister-in-law, and had Margaret triumphantly regained her position as queen with the final collapse of the house of York, then Anne's position would surely have been unrivalled as the mother-in-law of the heir to the throne. Instead, she was isolated and alone. She only had her younger daughter Anne for company, and as events were to prove, that was not necessarily a positive thing. Above: Isabel Neville, duchess of Clarence, firstborn daughter of Anne Beauchamp. The marriages of her two daughters caused the countess considerable stress. Her younger daughter Anne had married the king's youngest brother Richard, duke of Gloucester. In Clarence's lifetime, he had fought bitterly with Richard over the Neville inheritance. The countess resided in the household of her daughter, the duchess of Gloucester, but there may have been considerable ill-feeling between mother and daughter. Between them, the sons-in-law of the countess had effectively disinherited her. The countess did not meekly submit to the schemes of her sons-in-law. She responded furiously and expressed both outrage and disbelief. She perhaps viewed herself as betrayed by her own daughter. While in sanctuary at Beaulieu Abbey, the countess had written several letters seeking both her release and her control of her own wealth, swearing that she had 'neuer offended his most redoghted highnes' [Edward IV]. She was determined to exercise control over her own future and she would do whatever it took to do so. The countess sought the assistance of the queen, the king's mother, the queen's mother, and even the assistance of the king's eldest daughter Elizabeth. It was to no avail. The countess was legally treated as if she were dead. Her lands were divided between her two daughters and their avaricious husbands. She did, however, acquire an income from her son-in-law Richard III when he became king. It is worth noting that Henry VII was more generous in his treatment of the countess, providing her with 500 marks a year while granting her life estates in over two dozen manors and lordships. Henry also made her principal keeper of the forest of Wychwode. Anne died in 1492 aged sixty-six. Hers had been a long, tumultuous and, in many respects, tragic life. She had lost her husband in battle, her eldest daughter had died while still young, and she may have experienced conflict with her youngest daughter. Her lands and estates were seized from her by George of Clarence and Richard of Gloucester. She had been respected as the wife of the Kingmaker, but she had also been an outcast, perhaps even a pariah. She was briefly the mother of the Queen of England, but unlike Jacquetta Wydeville, Cecily Neville or Margaret Beaufort, she did not enjoy a position of power and influence as the mother of the ruler. We know very little about the countess and evidence is scarce. Whether the countess was scheming and ambitious, or whether she was more sympathetic, cannot be known.